"Tecumseh's Brother Was A Shaman"
"Tecumseh Subject of 40th Pageant"
Smith, Christopher, Brantford Expositor, Summer 1988 "The life of the great Shawnee Indian chief Tecumseh is being presented in the 40th annual Six Nations Indian Pageant this weekend and next." "Tecumseh Top of This Year's Pageant"
Twelfth in a 62 part series, Tehcumtheh’s Line in the Ground describes Tehcumtheh’s role in land disputes with the United States. A View of Col. Johnson's Engagement with the Savages (commanded by Tecumseh) near the Moravian Town, October 5, 1812. 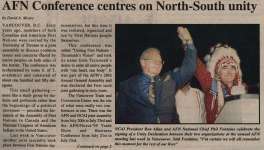 "Aboriginal Contributions to the War of 1812"
"AFN Conference centres on North-South unity"